Nobody expected this to be an easy series for the Windsor Spitfires. Facing the top-seeded London Knights is a tall order for any team. The Spitfires find themselves down two games and scrambling for answers. The Knights are a well-oiled mixture of NHL prospects and eager youth, while the Spitfires are a younger team that’s full of potential. Some might call it a David vs Goliath match-up; so far, Goliath hasn’t let up. Now, the Spitfires return home to the WFCU Centre and are searching for any solution they can find. It’s a herculean task but one that isn’t impossible. Early Friday, the Spitfires hit the road, ready for the opening two games against the Knights. 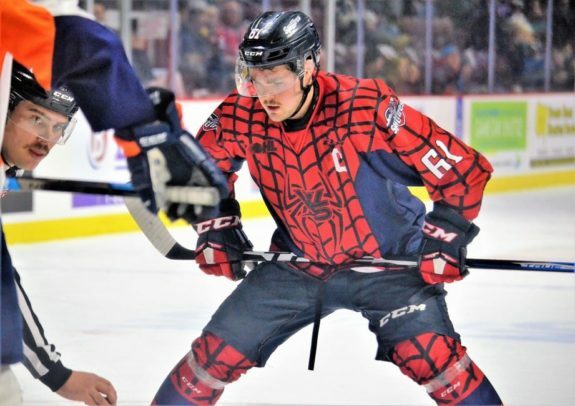 The Budweiser Gardens has been far from an easy building for the Spitfires this season, as they came in losing three straight and being outscored 20-8. Friday night’s Game 1 proved much of the same. Finnish rookie Kari Piiroinen started in net for the Spitfires and he was countered by London back-up Jordan Kooy. 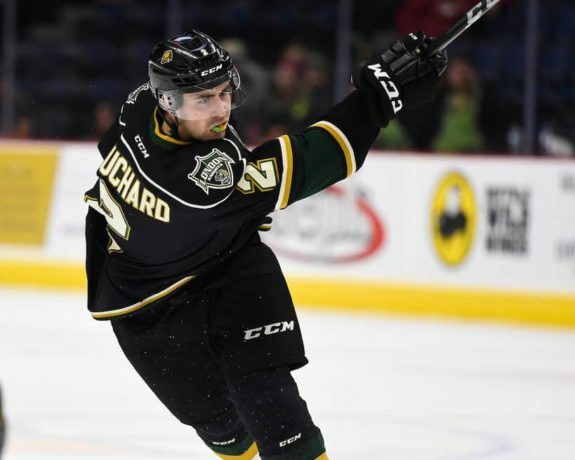 While Piiroinen did his best to keep the Spitfires in it, Knights’ captain Evan Bouchard had other plans. The Edmonton Oilers’ prospect had two goals and two assists in the first two periods, helping the Knights gain a 4-1 lead after 40 minutes. What didn’t help the Spitfires was recording just 10 shots on Kooy over that time. It took nearly 40 minutes for the Spitfires to finally get some shot consistency. Once they did, things changed a little bit. A pair of goals with under a minute to go in the game created some drama, but the Knights held on for the 4-3 win. Sunday afternoon’s Game 2 saw the second chapter become the same as the first. 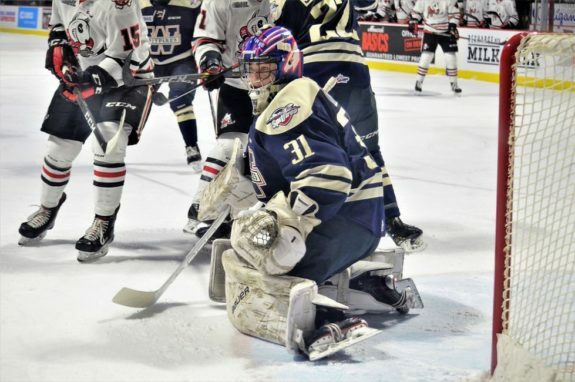 While the Spitfires changed things up in net, starting veteran Colton Incze, it didn’t help their offence. The Knights peppered Incze with 27 shots through 40 minutes, countered by just nine from the Spitfires. Nathan Dunkley got in on the action with a pair for the Knights, giving them a 2-0 lead. Early in the third, the Knights made it 3-0 on a goal from Connor McMichael. Soon after, Cole Tymkin finished off a tic-tac-toe play started by Bouchard. Tymkin added another late as the Knights earned a 5-0 win. A split was the goal for the Spitfires but now they head back to the WFCU Centre down 2-0 and hoping to avoid the sweep. With just nine road wins all season, life away from the WFCU Centre has been anything but easy for the Spitfires. This is why Tuesday’s game is so important. Coming home is a chance for redemption. It’s a chance to fix the wrong and change the game plan. What happened this past weekend clearly isn’t working. Take away the third period in Game 1 and the Spitfires were outshot 53-25 in the two games. Somehow, the Spitfires took 16 shots in that third period alone. This is where the Spitfires’ veterans and coaching staff need to step up. Being the underdog shouldn’t be an excuse. You won’t win games if you’re not challenging the goaltending, nor will you win if you’re not making your presence known. Over the final six regular-season games, Letowski guided the club to five one-goal games. They worked their tails off by firing the puck, using an aggressive forecheck and making their presence well known. That’s how you win in the playoffs, even if you’re inexperienced. 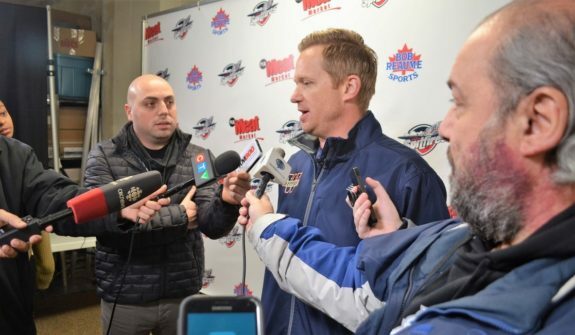 The Spitfires now have a bit of time to put together a new game plan and establish some home-ice presence. Even getting a split at home would show the hockey world that they’re not going down without a fight. We’ve seen what this Spitfires’ club can do when it truly wants something. They have the energy, the determination and the skill to make this series tough on the Knights. It’s a matter of finding that will and refusing to end the season in March. Game 3 is set for Tuesday while Game 4 is Thursday; both puck drops are at 7:05 p.m.